Living in Minnesota? Paintball fields near me? What paintball fields are near me? Do you live in the Minneapolis and Twin city area, you?ve come to right place. Just minutes from Minneapolis on route 196 is a paintball facility that will meet your needs for action and entertainment. Walk-ins are welcome on Saturday and Sunday. Group games are also available by advanced reservation from dawn to dusk Monday to Sunday. Get together two teams and face each other as the blue and gray army?s of the civil war. Challenge others in a fast pace survival game of Speedball where battle senses and reflexes are pushed to the limits. Do a house to house or room to room sweep to clear out enemies in a mock urban site. What skills will be needed to be able to survive in the urban jungle? What do paintball fields near me offer; the above is only a sample of the excitement. Don?t have enough for two teams, no problem come alone, and join in and meet new friends. Are the paintball fields near me closed during bad weather? No, we do reserve the right to close the area for severe weather conditions such as lighting and thunder storms. Paintball fields are open all year long even during winter. We also have indoor fields located in downtown Minneapolis and Maple Plain. 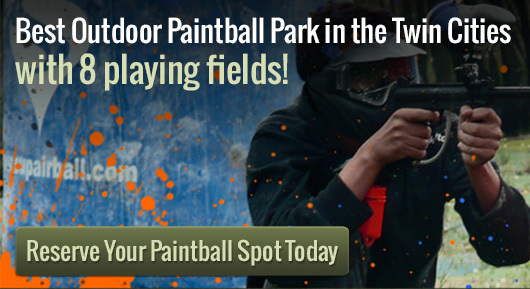 Any time is a great time to have a paintball event, birthdays, company parties, weddings, family reunions call now for private reservations, just lets us know a week in advance, what field you would like to reserve. Meet new friends or renew old ties here at our paintball fields.